Microsoft Teams is best suited for scenarios where you are working with a group of people on a given project. These are the people in your “Inner Loop” (or “Circle of Trust” as I prefer to call them). Because Microsoft Teams is built on Office 365 Groups, this group of people will have access to the SharePoint site created by default for each Team. That’s where I can share documents and files with the Team. If you’re a member of that Team – you have access. Since an Office 365 Group is also mail-enabled, I can send email to the Team channel so that everyone has access to the information in the email. Teams also incorporates all the features you love from Skype for Business – Instant Messaging, Presence, Conferencing, calling capabilities, etc… Teams keeps the conversations in a persistent, threaded format, so we can always go back and review questions that came up or decisions that were made. And with the Guest Access capabilities for Teams, you can extend the reach of your Team outside your organization. In effect, Microsoft Teams is a portal into Office 365. Yammer expands the scope of who has access to a given set of content and the conversations. 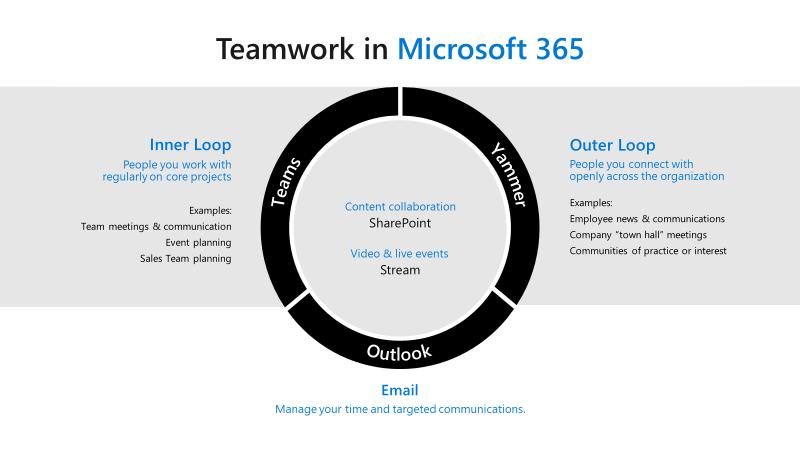 The people in your Yammer group are the “Outer Loop”. Sure, you still like and trust the people in your Outer Loop, but it’s a different type of interaction. Information and conversations flow much more organically and is likely not going to be project -specific. For example, Yammer groups are more likely to be centered around certain technologies (such as Microsoft Exchange) or areas of expertise (“Security” or “Education”) than to be focused on a project (“Contoso Azure Deployment”). This allows for people to jump into Yammer groups at any time and still benefit from the historical knowledge of the Yammer group. And just like with Teams, new Yammer groups are built on Office 365 Groups, so the Yammer group has access to OneNote, a Planner for managing tasks, a SharePoint team site and document library. Outlook. We all know that Outlook is often the easiest tool for sharing a file….one time. But things start to get sticky when you have to ask multiple people to edit the document or comment on it. Then we run into versioning issues, and you have to find the right copy of the file in your email thread…it’s just not the best tool for really collaborative work on a large team. Rather, Outlook is good for targeted communications – confirming an appointment with a customer, verifying information in a proposal. Now the neat thing is that Outlook also allows you to connect to the mailboxes for Office 365 Groups. This allows you to view and reply to email messages that land in the mailbox of the Office365 Groups you are a member of directly from your Outlook client. Hub for teamwork with effective teamwork: To enable this scenario, TechGyan usually starts with building a solid foundation of identity, security and access management for the customer to access Office 365 services securely and successfully. 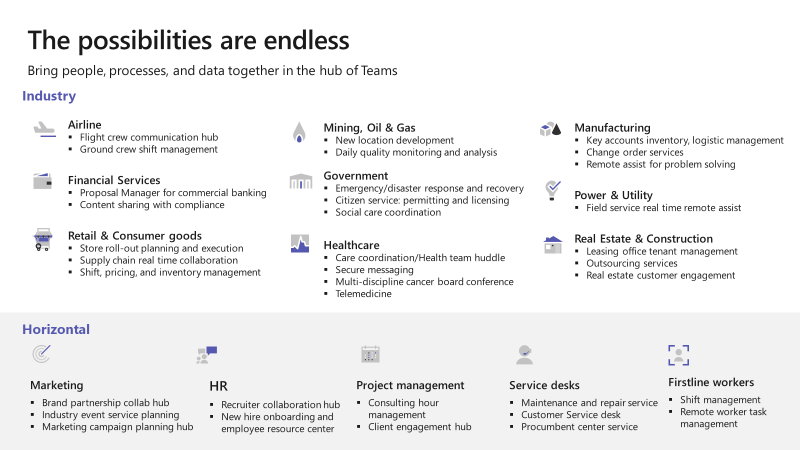 Next, the hub for teamwork is implemented using Microsoft Teams for chat-based teamwork, enabling new ways for employees to collaborate together. This scenario can be extended to the Firstline Worker to enable those employees with secure access to Office 365 and allow them to participate in virtual teams using Microsoft Teams. to engage with their peers and leadership, share collective knowledge, have a single place for on-boarding and training materials, participate in communities of interest and modernize First-line employee scheduling and task management processes. Business transformation: Building upon the first two scenarios brings us to business transformation, where TechGyan can help the customer to realize additional value out of the other scenarios by using them to transform business processes by creating end-to-end workflows, building content management solutions to make discovering intellectual property (IP) easier and promote re-reuse of the IP to building intelligent bots that can automate tasks. As teams work more together closely, employees are also becoming more geographically distributed. Seventy-two percent of employees will be working remotely by 2020 making face-to-face, in-person conversations increasingly unlikely, if not rare. There’s a greater need to enable communications and collaboration—regardless of geography. 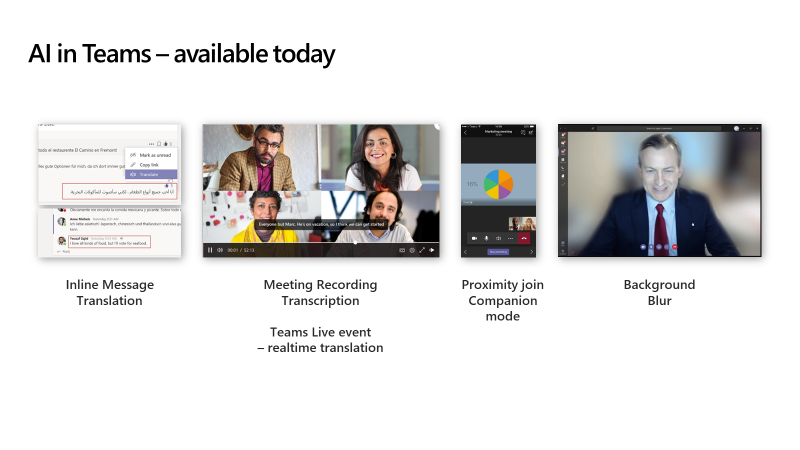 Microsoft Teams offers a complete meeting solution supporting sharing, video and audio conferencing that enables you to meet from anywhere. And no worries if you miss a meeting – team members can access recordings with transcribed and translated text that is indexed so that people can search for content relevant for them. You can also translate them with a simple click. Inline message translation allows you to translate messages in channels and chat - into almost 40 languages. With a simple click, people who speak different languages can fluidly communicate with one another ensuring that every worker in the team has a voice and facilitate global collaboration. Meeting recording and transcription powered by Stream enables all team members to easily catch up on missed meetings as you can read the transcription, search within the conversation, and playback all or part of the meeting. 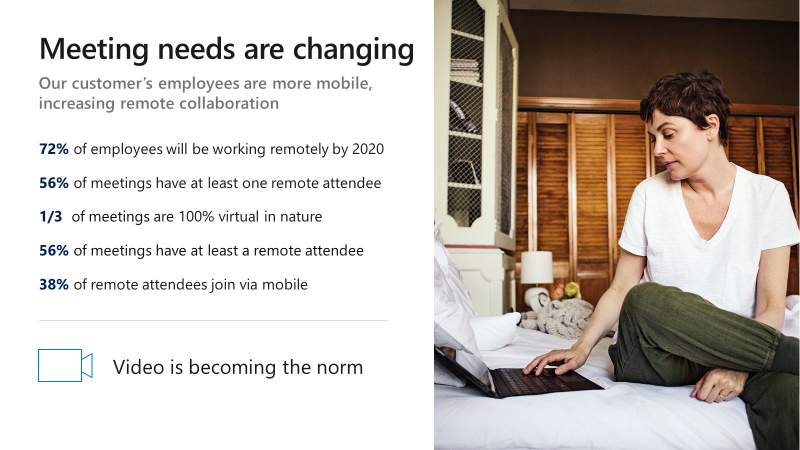 With the mobile companion mode, Teams picks up if you are in a meeting room or suggests that you can use your phone as a companion device, so you can for example advance slides from your phone. With background blur, participants can blur their background during a video call to ensure professional meetings on-the-go or avoid possible disturbances in the background like a dog running into the room. This allows other meeting attendees to focus on you, not what’s behind you. Centralize online file storage and document sharing. Co-author documents with popular Office 365 apps like Word, Excel, PowerPoint, OneNote, SharePoint, and Power BI. Easily keep track of conversations with persistent chat and messaging. Flag team members to share important notifications. Easily share files with co-workers, outside contractors and suppliers. Teamwork and collaboration tools with built-in security. Eliminate usage of unauthorized apps to reduce unintended security risks. Streamline governance by defining naming convention and expiration policies. Protect sensitive content using data classification capabilities. Meet compliance requirements with built in data governance capabilities. Save time with high fidelity video and web conferences. Integrate notes, shared files and screen sharing to make online meetings more effective. Join meetings on the go to effectively share and communicate. Use an online scheduling assistant to simplify coordination of schedules.